No, nobody died. So why “funeral potatoes” you ask? Well, you know how people always bring food to a wake or a funeral when someone passes away? Funeral Potatoes are one of those dishes that’s frequently brought to that somber gathering. Hence, the name. It’s basically a simple potato casserole made with frozen hash browns. There are many versions of the recipe floating around out there. This is how I make mine. It’s super easy to prepare and everyone always likes it. The best part is, it’s not just for funerals. You can serve it any time of the year. It makes a great side dish for a busy weeknight dinner with the kids. I’m actually making it for Easter Sunday brunch this year. Take hash browns out of the freezer and set them on the counter to thaw a little while you prepare the rest of the ingredients. This makes them easier to mix. Melt ¼ cup butter in a skillet. If you want more buttery potatoes, you can melt up to ½ cup. Add onions and cook, stirring frequently, until translucent but not brown. In a large bowl, whisk together the sauteed onions, soups, sour cream, cheddar cheese, parmesan cheese, salt, pepper, and parsley, if using. Stir in the hash browns until well-combined. Spread mixture into a 9×13 casserole dish. Sprinkle French’s fried onions on top. Bake for 40-50 minutes or until sides begin to bubble and top is golden brown. TOPPING VARIATIONS: Toss 4 tbsp. melted butter with 1½ cups panko bread crumbs, or crushed crackers, or crushed cornflakes, or crushed potato chips. Did you know that February 2nd is National Tater Tot Day? It’s an easy day for me to remember because it’s also my only brother’s birthday. Tater tots are an iconic American food that was created in the early 1950’s. The founders of Ore-Ida were trying to figure out what to do with all the little leftover pieces of potato that they had tons of everyday. They chopped up the potato pieces, mixed them with flour and seasonings, then forced the mixture through the barrel of an extruder, slicing off little one-inch pieces as the mixture came through. And so the tater tot was born. Actually, when the little potato nuggets were first created, they didn’t have a name for them so the owners of Ore-Ida decided to have a name-the-product contest among their employees. The name “Tater Tots” was submitted by a young mother named Clora Lay Orton. Everyone loved the name and she won the contest. It’s hard to believe that when the inexpensive tater tots were first sold in stores in 1956, they didn’t exactly fly off the shelves. Today, Americans consume approximately 70 million pounds of them per year! It’s safe to say the lowly tater tot has finally found its place in society, from school cafeterias to the ever popular food truck. It’s certainly found its way to our dinner table! While tots are baking, combine sour cream and ranch dressing in a bowl. Drizzle sour cream mixture over baked tater tots. Place under broiler until cheese is completely melted. Remove from broiler and top with crumbled bacon and green onions. Return to broiler for 2-5 minutes to warm up the bacon. Today was a scary day at work. I arrived at the office to be greeted with the news that our Vice President had called an impromptu “Organizational Announcement” meeting. Everyone was to report to the meeting at 9 a.m. sharp. The VP’s announcement was that they were going to be outsourcing some of our jobs and some people would be laid off at the end of this year. So sad. It’s hard to understand the business decision to cut costs by sending our work abroad, but it’s harder to accept when good, hardworking employees of long standing are laid off without a qualm. I’m one of the lucky ones who gets to keep her job but my heart breaks for my friends who don’t. I think comfort food is called for tonight. And what could be more comforting than a yummy bowl of tomato soup? Add a grilled cheese sandwich and you’re instantly transported back to those carefree childhood days when it seemed like nothing could go wrong. This soup is delicious and very easy to make. Instead of grilled cheese sandwiches, I gave it a different touch by making Crispy Mozzarella Cubes to serve with it. Yum! Now if only the job situation at work were as easy to fix. Sigh….. In a medium pot, heat the oil. Add the onion and cook over medium heat, stirring frequently, until translucent. Add the garlic and thyme, stirring until fragrant. Add the tomatoes, broth, and honey, and stir together well. Season with salt and pepper if desired, and bring to a boil over high heat. Reduce heat to medium-low and simmer about 15 minutes, stirring frequently. Puree soup with an immersion blender. If you want it chunky, puree only half the soup. Stir in the cream, adjust the seasonings, and continue to cook for another minute or two. Ladle soup into bowls and garnish with parsley, if desired. Heat 2 inches of canola oil in a deep frying pan on the stove. Cut mozzarella cheese into cubes as small or large as you like. I like a good-sized cube so I cut them about 1½ inches big. Place about 1 cup flour in a pie plate and season lightly with a little salt and pepper. Beat 1 egg in a shallow bowl and season lightly with a little more salt and pepper. Place about 1 cup panko bread crumbs in another pie plate. Take a mozzarella cube and coat it first in flour, then egg, and finally bread crumbs. Repeat with remaining cubes. If you run out of flour or bread crumbs, just add more, and beat another egg if you need to. Carefully drop each coated mozzarella cube into hot oil. Transfer briefly to paper towel lined plate to drain. I make these bars a lot during zucchini season. The zucchini is like a “surprise ingredient” that fools everybody. They all think it’s apple and don’t believe me when I tell them it’s zucchini. 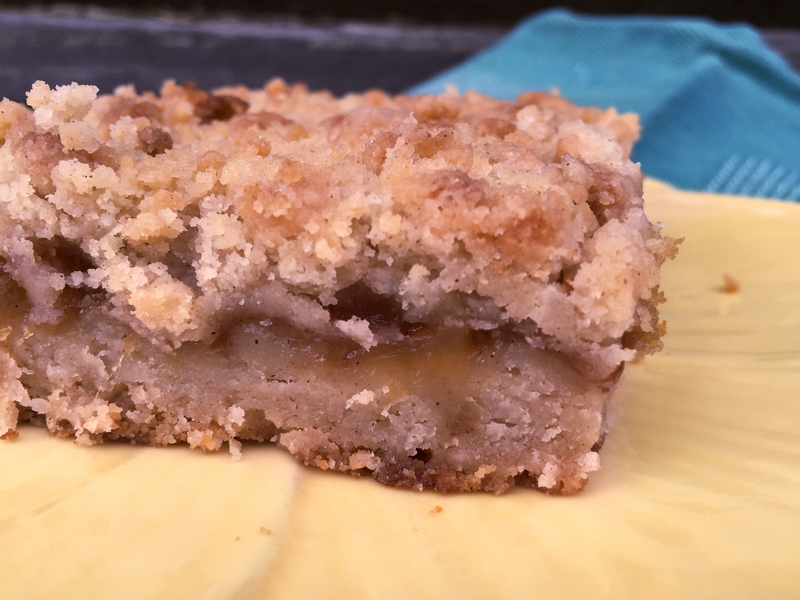 These bars are delicious, and best of all, are so easy to make. My family loves to eat them warm with a scoop of ice cream. Give them a try and see if they don’t surprise you, too. In a large saucepan over medium heat, cook zucchini, lemon juice, sugar, vanilla, cinnamon, and nutmeg, stirring occasionally until zucchini is crisp-tender, about 15-20 minutes. While stirring constantly, pour in slurry (cornstarch water mixture). It is important to keep stirring as the slurry will thicken the mixture very quickly. Continue to cook and stir, 1-2 minutes more, until mixture is thick and glossy. Preheat oven to 375ºF. Grease a 9×13-inch baking pan. Combine flour, sugar, cinnamon, and salt in a large bowl. Set aside about 3 cups of the crust mixture for topping. Press remaining crust mixture into bottom of prepared baking pan. Pour zucchini mixture over crust, spreading evenly to edges. Crumble remaining crust mixture over zucchini mixture. Bake for 35-40 minutes or until top crust is golden brown. This is an old Bisquick recipe and is delicious served as an appetizer or for a light lunch or brunch dish. It’s easy to make and is a good way to use up extra zucchini when it’s in season. I think the addition of oregano adds a bright herby flavor to this dish but you could omit it if you like, or substitute a different herb like thyme or savory. Preheat oven to 350ºF. Grease bottom and sides of a 9×13″ baking pan. In a large bowl, whisk together the eggs, parmesan cheese, oil, parsley, garlic, oregano, salt, pepper, and Bisquick. 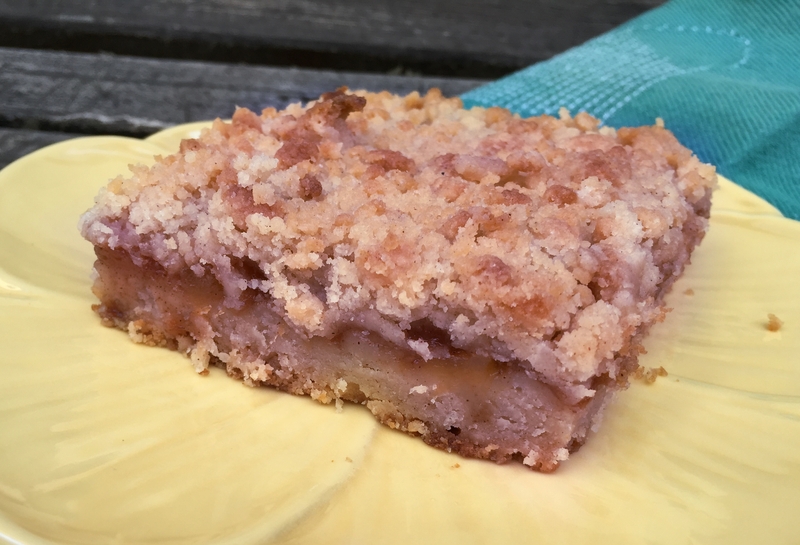 Cut into 1¼-squares and serve warm or at room temperature. This is an old Pampered Chef recipe that I learned to make many years ago when The Pampered Chef was still in its early years. The company operates on the same principle as Tupperware — people host a party where the company’s products are demonstrated and sold. I attended a Pampered Chef party where this dish was served and loved it so much that I made it myself for the party I subsequently hosted. It’s been a favorite with my family ever since. A lot of times, I make the recipe healthier by substituting reduced fat crescent rolls, fat-free cream cheese and/or lite mayonnaise. Anyway, it’s the last day of Nurses Week tomorrow so I’m making this to take to the office. I know the nurses will love it, especially since I’m making the healthy version. Did I ever mention that I work with a bunch of nurses? Well, I do. So healthy food always goes over big at our office potlucks. Unroll crescent roll dough onto a cookie sheet and pinch seams together to seal. Combine cream cheese, mayonnaise, garlic, dill weed, salt and pepper together in a small bowl. Spread the cream cheese mixture evenly on top of cooled crust. Coarsely chop your selected vegetables. 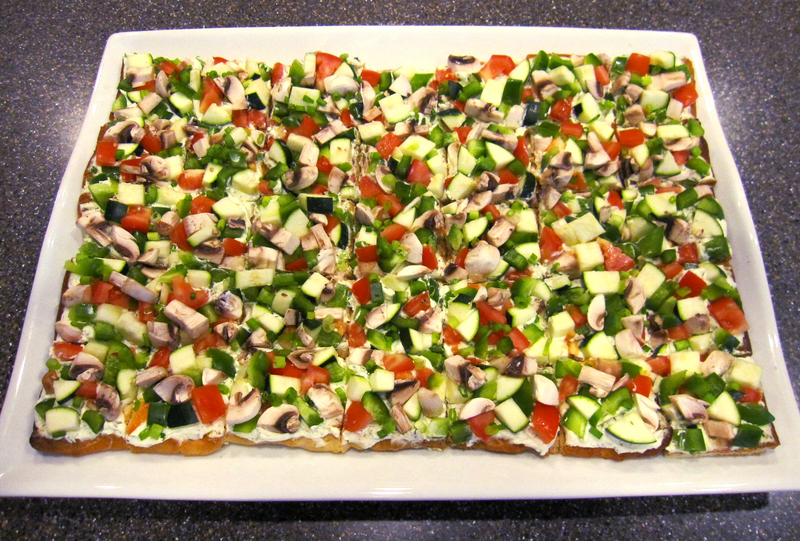 Sprinkle a layer of each vegetable over pizza crust. If you don’t like dill, you can substitute Italian Seasoning mix. You can also omit the garlic if you want to. My favorite combination of veggies that I use whenever I make this pizza is: zucchini, mushrooms, green and red bell peppers, tomatoes and green onions. I learned to make this dish many years ago, way before I even got married. 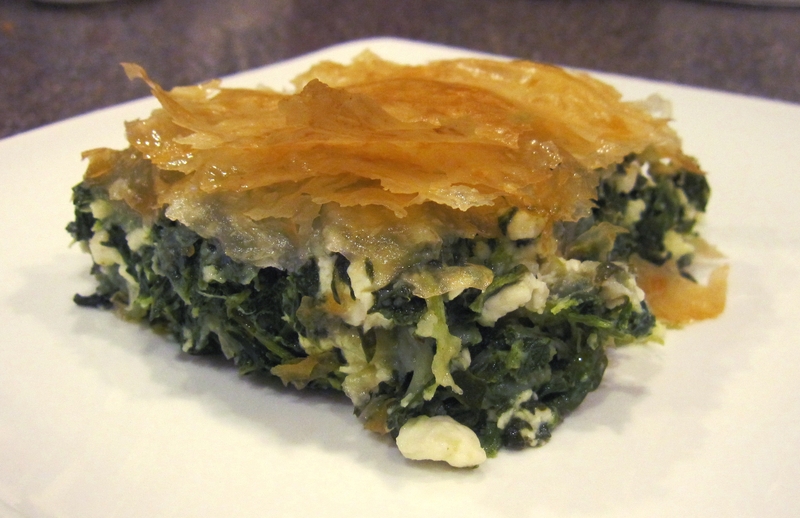 Spanakopita is a Greek spinach pie that’s traditionally folded into little triangles and eaten as a snack or appetizer. This recipe veers from the traditional in that it’s made into a casserole making it a lot less work than folding up a stack of little triangles. The combination of spinach and feta cheese is delicious, and the many layers of crispy phyllo dough make it seem like you slaved for hours over the stove. It’s a great side dish to serve at a dinner party or to take to a potluck. It looks impressive and tastes it, too! Combine the first seven ingredients in a bowl. Butter the bottom of a 9” x 13” pyrex glass baking dish. Place 4 phyllo leaves on the bottom of the baking pan, brushing each leaf with melted butter before placing the next leaf on top. Pour one-third of the spinach mixture on top of the buttered phyllo leaves. Top with 4 more phyllo leaves, brushing each leaf with butter. Continue layering until all the spinach mixture is used up. 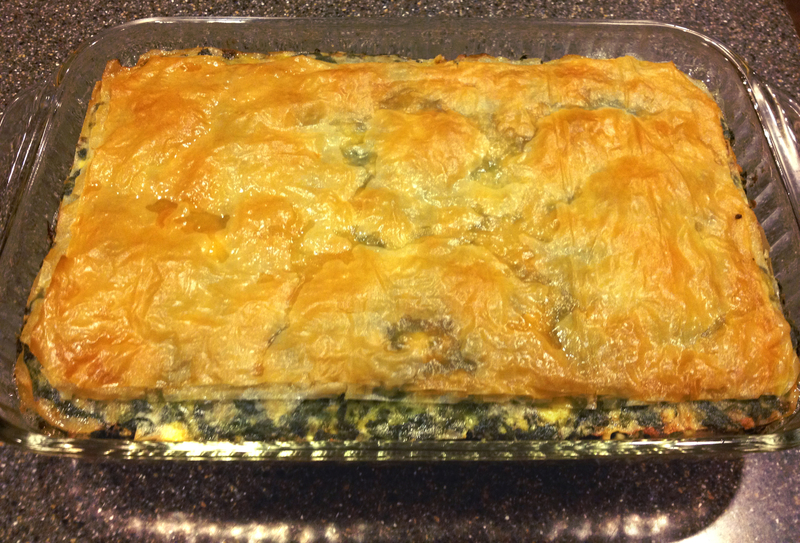 Top with a final layer of buttered phyllo leaves. If you want a thicker, flakier crust, you can add more phyllo leaves. Just be sure to brush each leaf with butter. Bake at 375º for 30 minutes or until top crust is golden brown. NOTE: You may use fresh spinach if desired. Just chop it up.